When we were kids, we looked forward to the dandelions. They were so useful for making mud pies. How could I know that mud pies weren't edible? They sounded edible. I made them for all the little kids, decorated with the bright yellow dandelion flowers and greens. I served them on my doll's plates and the kids ate them right up. Fortunately, my mother was a nurse and not the hysterical type. She always said you'd eat a peck of dirt in your lifetime. Luckily dandelions aren't poisonous. Baseball then meant baseball in the backyard. Of course, as the only girl with four brothers for a while, I was always steady catcher. Until my dad came into the yard, then suddenly I was put onto a team and given a chance to hit. My dad, a first generation Italian-American, was a believer in equality for women. Not for nothing did he champion Title IX years later, mandating that women's sports have equal footing in college sports. For me now, baseball means the Yankees and the joy of listening to or seeing a game almost every day. Does it get any better? Only if you're eating a soft-shell crab at the same time. The season is short and you have to take advantage. Daddy loved soft-shell crabs. He and I shared this seasonal passion. His favorite way to eat them was deep-fried on a hamburger bun with lettuce, tomato, and tartar sauce. For him that was soft-shell perfection. There are those who like grilled soft-shell crabs, and they are delicious. You marinate them for a few hours in olive oil and lemon or lime juice and your favorite seasonings, and they are excellent. But for me, sautéed saucy soft-shell crabs are nirvana. I have created a recipe that I have to say tastes heavenly. Every year, my friends wait impatiently for me to make them. I've never featured one of my own recipes before, but I decided that in this case I had to make an exception. So I forced myself to sit down and figure out exactly what I do. Or rather, I made the recipe with my husband, John, following every step, stopping me, measuring and writing it down so that I could share it here with all of you. I have always had great respect for my cookbook-writing friends, especially my dear friend, Rachael Ray, who has so many recipes to write for her various shows, magazine, and books. Now I have even more respect. It is really hard to write up a recipe. Give this a try if you like soft-shell crabs. I don't mean to toot my own horn, but they do taste really good! Happy Spring! This is a two-part cooking process in which you brown the crabs first in olive oil, remove them to oven, and then make a sauce. Cooking time is about 20 minutes. Get two soft-shell crabs per person. Have the fishmonger clean them for you shortly before you are going to make them. Pat them dry. Preheat the oven to 200 degrees. Put 1/2 cup of olive oil into a large skillet. Heat oil until it is hot. Dredge each crab in the flour which you've spread out on a dinner plate. Shake each crab well in turn, and put them quickly into the pan, bottom side down. You should hear a sizzle when they go into the oil. Cook on medium high heat until the crabs turn red. It takes about 6 minutes. By then it should be brown on the bottom. Turn the crabs over, and cook for another 2 minutes or so. You want the crabs golden brown and crispy on each side. Remove them to an ovenproof plate. Sprinkle with a dash of kosher salt and a grind of fresh black pepper. Place the platter in oven to keep warm. Discard the oil in the pan, then reuse the skillet. Now you make the sauce. Into a fresh pan, place 5 tbsp. butter and 1/8 cup olive oil. Heat on medium until melted. Add 1 tsp. of capers and stir with wooden spoon. At least that's what I prefer! Add 1/2 tsp. of Worcestershire sauce, a dash or so of Tabasco sauce, and 1/3 cup dry white wine. Let that all come together. 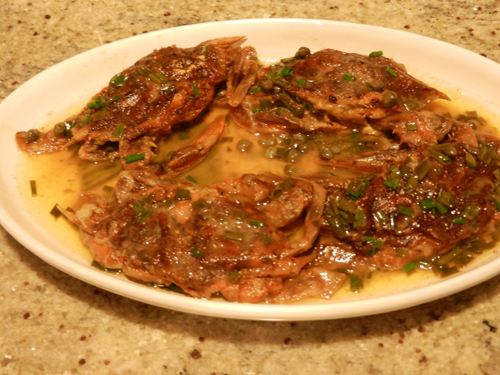 Take your soft-shell crabs out of the oven and put them into the sauce. Spoon it over them well so that they really take a swim in the sauce as it thickens more. Put at least half of the juice of the lemon in then and stir it well. Then snip the fresh chives all over the top of the crabs and sauce for garnish. Baste the crabs again before you take them out and then serve immediately, with the extra lemon slices and a glass of wine. So good! You'll want to enjoy it every spring! This recipe and video and many other family favorites are available on DishandDine.com. Stop by and become part of this grassroots global food community!